Catechol is a molecule that can readily oxidize to o-quinone through the transfer of electrons, thus making it a viable antioxidant. In fact, it has been shown that catechol can work as an antioxidant additive in biofuels to make them more efficient. This additive could further the potential assimilation of biofuels into common use and lead to them being a primary energy source over fossil fuels. The goal of this research is to better understand the redox behavior of catechol in order to increase its oxidation efficiency. By tuning the electronics of the base catechol we hope to relate its oxidation potential to an electronic parameter. We aim to accomplish this by using readily available borinic acids as catalysts. 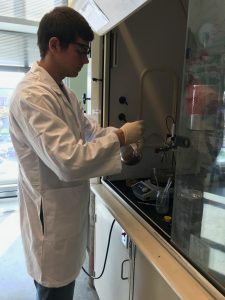 Boron reagents are becoming more widely used reagents in organic synthesis because they are relatively stable and environmentally friendly and our lab believes that they can be exploited to control the oxidation potential of catechol. By controlling the electron density on the borinic acid through varying functional groups, the oxidation potential of catechol and be fine tuned. From this learned relationship, we can then add a catalytic amount of borinic acid to biofuel to increase the antioxidant efficiency of catechol and thus potentially making biofuels more efficient. This will provide a cleaner future and may open the door to much more research on the efficiency of biofuels.